The game's camera angle can be confusing at times. There’s a slight bias in some areas with games that I like. I do enjoy plenty of sports games, largely if I love the sports. I try not to focus on sports games too much, specifically football, as there’s very little to choose between them at the best of times. As such, if a football game needs to be stunning (such as Sensible World of Soccer) or be different from the norm (such as Super Sidekicks). Libero Grande fits into the latter category. Traditionally, football games required you control the whole team. This allowed for you to easily put together sweeping counterattacks, excellent defence play and all sorts of tactics that you have seen on the pitch, but this is because you have control of the whole team. In Libero Grande, you only have control of one player. This one player is considered the “star” player, and is picked at the beginning of the game from a roster of players, each one having a different skill level. Although they don’t have the official names, they are actually based on real world players, and anybody with a basic knowledge of world football at the turn of the century can figure out who they are. The player you pick also determines what position you play when you start the game. Pick a strong defender, and you will be a centreback. Pick a striker and you will start up front. Strong passers will begin in the midfield, and speedy players will begin on the wing. It’s also when you start the game you notice that not only are you in a position, but you’ll have to stay there. Failure to do your job and your team will struggle. It doesn’t mean you won’t win (far from it, in fact one problem with this game is the easiness of the earlier levels). But it’ll be a bit squeaky bum if you’re not upto scratch. 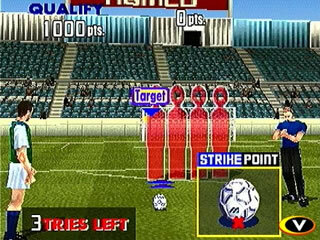 The game also has a unique perspective of the action the pitch. The camera is firmly behind your player, and can be confusing to begin with, as turning your player doesn’t necessary turn the camera. Instead the camera is fixed on the ball, so running forward enough and you should hopefully reach the ball. As I said, it is a little confusing to begin with, but once you get used to it, it’s actually useful. Thankfully the controls are easy, with buttons for pass, shoot & tackle. Not having control of the ball and pressing pass or shoot tells the person in control of the ball to pass (if possible), or shoot. This game was originally a fairly standard arcade game, where you had to lead your team to win a fairly nondescript tournament. 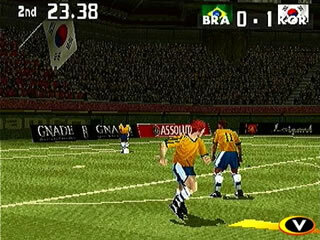 The Playstation version added in a more structured World Cup mode, as well as a league mode, and a training mode to help hone your skills. So, where does it stand on “greatest football games ever”? Well, above average. It’s not going to change the world, and it’s certainly not the first, nor the best football game where you control one person – (both Nintendo World Cup and Player Manager are better). Nevertheless, it did bring the gaming style of football games to the forefront. When you see the Pro Evolution game on the Wii, you can see that in part it was inspired by Namco’s foray into the football game. That must be worth something, surely.